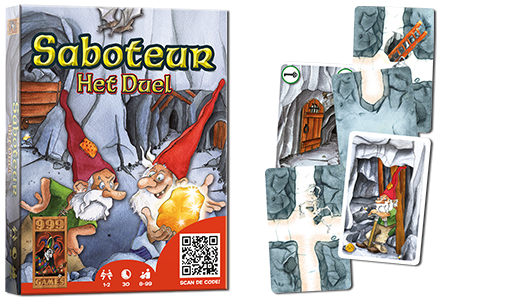 The Dutch version of Saboteur: the duel is released by 999 Games. This game has been designed for 1 and 2 players. The other language versions are in preparation and will be released in 2015. Which game could I recommend you? Saboteur, the basic game, was designed for 3 to 10 players. It's really very fun and balanced with 6 to 10 players. The rules are simple and straightforward, which makes it an ideal game for casual players. Saboteur 2, the expansion, was designed for 2 to 12 players. Due to the increased complexity (extra roles and extra action cards), it's more suited for experienced players. The game play is also a little bit longer. Therefore, I prefer it for 3 to 6 players. Saboteur 3, the duel, was primarly designed as a solitaire game with a 2-player variant. For commercial reasons, it has been packaged as a 2-player game with a solitaire variant. Alone, you try to reach the most gold and with two, you try to get more gold points than your opponent.